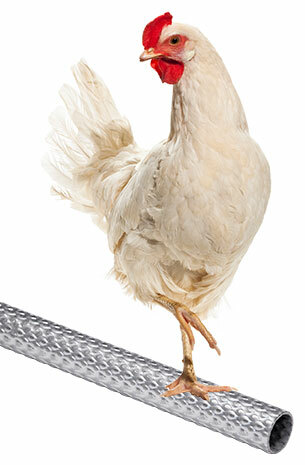 For over two decades, Allied Tube & Conduit® has served the poultry industry and developed our Diamond Back tube to be used as perch stands for egg laying facilities to promote happy chickens. The Diamond Back embossed design prevents chickens from slipping unlike the typical industry standard smooth perch stands, and it also stands up against the elements and bird droppings. The embossed design also keeps the chicken’s feet clean. Unsurpassed Corrosion Protection – Gatorshield® is more resistant to rust than any competitive tube product. The Flo-Coat process makes the difference! Contact your local sales rep and try our Diamond Back embossed tubing today!